This vegetable got well and truly hit with the ugly stick, but appearances can be very deceptive. Celeriac may not look very special but it tastes divine. Thanks to the wonders of our fantastic local growers who plant different varieties and help us to store it effectively, we can offer UK grown fresh celeriac for a tantalising 11 months of the year. Perhaps best thought of as a sophisticated flavour alternative to potatoes and turnips, celeriac is a root vegetable with a distinctive celery-like taste. It’s great cooked as a vegetable on its own (roasted as chunky chips with paprika is really good), or mashed in with potato for a refreshing change. Celeriac soup is a delicious winter warmer with some crusty bread and (optional) a wet dog by an open fire. 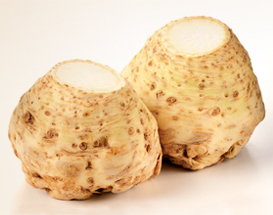 For multiple retailers we supply celeriac loose unwrapped, netted or shrink wrapped and labelled for extended shelf life.